What Does It Mean When a Tree Bleeds Sap? There are some trees that you should wait to prune until later in the spring because they tend to bleed sap. What does this mean and should you be concerned? Why Do Trees Bleed Sap? Much like the veins in our body, the tree's vascular system transports sap. This is a sugary liquid filled with water and nutrients that is carried throughout the tree via the phloem and xylem. Phloem carries nutrients from the leaves to other parts of the plant, while xylem carries nutrients upwards from the roots. Sap is produced in the leaves (or needles) of a tree and is distributed throughout the tree through the phloem, which runs vertically from top to bottom on the tree. If a cut is made in the trunk or a branch of a living tree, the cut severs some of the phloem, allowing the sap to ooze out. The best way to control bleeding sap is to prune at the right time for that particular species of tree. In general, this means that you want to prune deciduous trees that are prone to bleeding after their leaves have fully developed in late spring or early summer. If your pruning cut does bleed, just leave it alone. Don't paint or cover the wound. The one exception to this is if you have an elm or oak tree that is bleeding. These are highly susceptible to Dutch elm disease and oak wilt, respectively. According to the U.S. Forest Service, applying pruning paint helps prevent these diseases. In a Dutch elm, for instance, painting the pruned location will prevent elm bark beetles from being attracted to the tree. It's a very important step in keeping your trees healthy. If you have any of the following trees, it is very likely that they will bleed sap when pruned. To avoid this, be sure to research the proper times to prune each tree before you make the first cut. 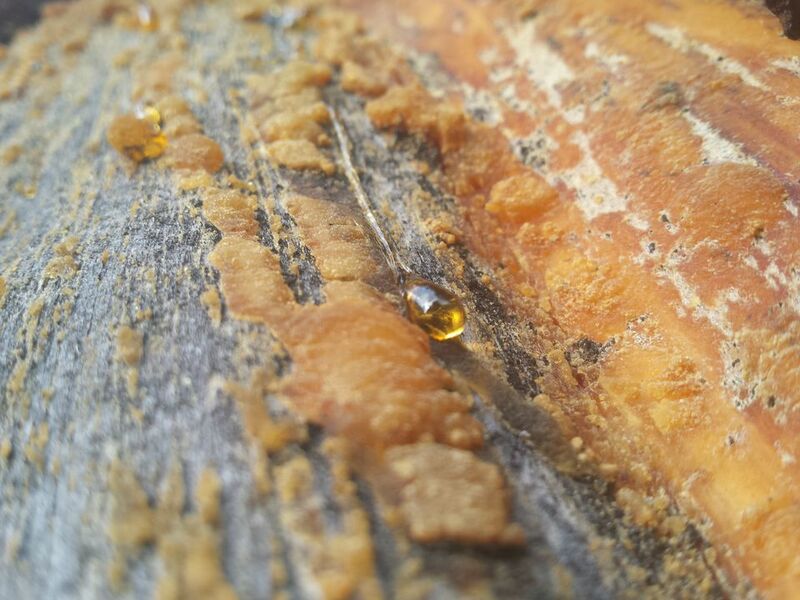 Bleeding sap isn't always detrimental, and sometimes we can even put it to good use. One of the best examples is when the sap is collected from maple trees each year, which is done by tapping the trunk of a sugar maple. It can take up to 50 gallons of sap to make one gallon of maple syrup. The sap of birch trees also can be used to make syrup as well as homemade beverages, such as birch wine, birch mead, and birch beer (similar to root beer). What Are the Key Signs of a Healthy Tree? What Does It Mean to Say a Soil Is "Acidic?" Can You Name the Tree With the World's Biggest Leaves? What's the Difference Between Rhododendrons and Azaleas? Is Bladder Senna Right For Your Yard?